5 [[underline]]ELECTED[[end underline]] Our congratulations are extended to Paula Campos, newly elected president of her floor in Burge Hall, a University of Iowa dormitory. Paula is secretary of the Chicano Indian Cultural Center, 115 N. Clinton, Iowa City, and a university freshman. [[underline]]BODAS (ANNUNCIOS)[[end underline]] [[underline]]Paula Plasencia[[end underline]], former University of Iowa student and member of the Chicano Indian Student Union, was married in Des Moines on Saturday, September 16. Best wishes to Paula and to [[underline]]Robert Juarez[[end underline]] whose wedding is on the seventh of October. All members of the Chicano Indian Student Union are invited to the wedding in Rock Island, Illinois. [[underline]]CHICANO LIT[[end underline]] The Chicano Literature class coordinated by Armando Almazan and Lee Paradise is being offered through Action Studies as a non-credit course. Hopefully heads will be together on Tuesdays as the class meets for the third time on the 26th. (we didn't count the 4th.) 7-9 p.m. Phillips Hall [[underline]]NOTICE[[end underline]] Members of CIASU: keep your eyes open for announcements regarding meeting times, Teatro practice, and other activities schedules. Cooperation with the new employees of the Chicano Indian Cultural Center is essential. Hector Gamboa, Director del Teatro will be posting practice times in the Center. Hired for various positions are Connie Moreno, Benjamin Pintor, Jose Izaguirre, Eduardo Ildefonso; Aides-Antonio Zavala, Advisor-Paula Campos, secretary. Our maintenance man will be Miguesl Rodriguez. Group Peer Relators for Special Support Services are Elisa Sanchez and Aaron Rivera. Both will be keeping office hours at the Center. [[underline]]FT. MADISON, IOWA[[end underline]] On September 16, the Chicano Indian Cultural Center was invited to send representatives to the annual fiesta in Ft. Madison, Iowa, commemorating El Dia de Independencia. Those who attended had the opportunity to speak with members of the community about the Chicano Indian Cultural Center and the educational opportunities at the University of Iowa. It was expressed by the students and community members that further exchanges be planned in order that a viable means of communication between the university and the Chicano communities be established. A special thanks to Fidel Alvarez for the invitation. Those of us who went had a fine time and hope to return with other representatives of the Center. 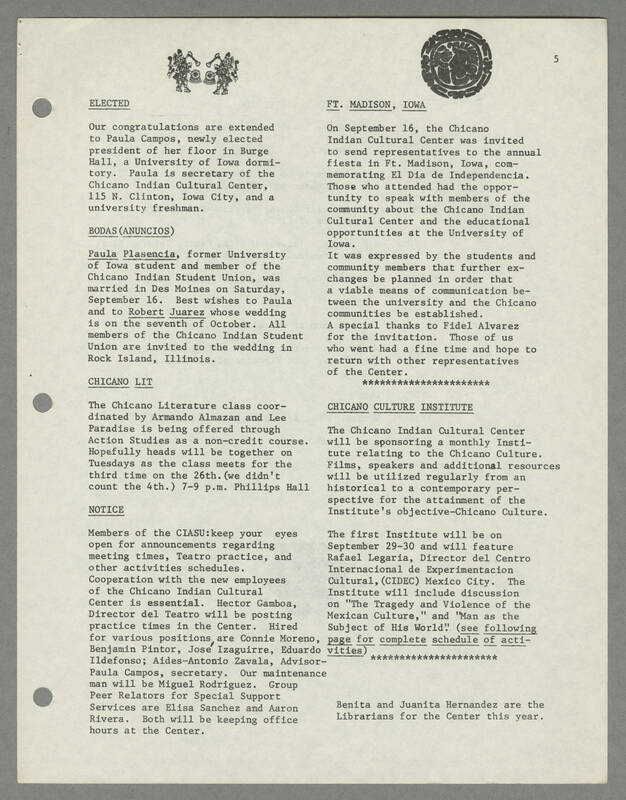 [[underline]]CHICANO CULTURE INSTITUTE[[end underline]] The Chicano Indian Cultural Center will be sponsoring a monthly Institute relating to the Chicano Culture. Films, speakers and additional resources will be utilized regularly from an historical to a contemporary perspective for the attainment of the Institute's objective-Chicano Culture. The first Institute will be on September 29-30 and will feature Rafael Legaria, Director del Centro Internacional de Experimentacion Cultural, (CIDEC) Mexico City. The Institute will include discussion on "The Tragedy and Violence of the Mexican Culture," and "Man as the Subject of His World." ([[underline]]see following page for complete schedule of activities[[end underline]]) Benita and Juanita Hernandez are the Librarians for the Center this year.